… thanks to Officer Kublo and others from the 20th Pct who responded professionally and promptly to Erica’s accident. 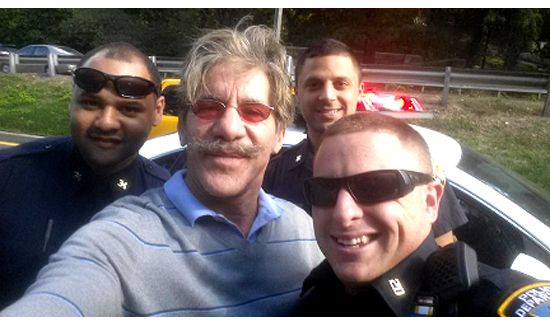 Elderly idiot and selfie-addict Geraldo Rivera recently snapped yet another “selfie” while sharing that his wife Erica and daughter Sol had just been in a car accident. Thankfully this time the septuagenarian was fully clothed. Surely this is proof positive that so-called “social media” is a gift from the Gods. “Erica and Sol are fine but her Range Rover’s a mess after guy from out of state stopped short on the West Side Highway,” Rivera wrote on Twitter. He included a tweet with a photo of what appeared to be the damaged vehicle. The only thing that makes the story remotely believable is the fact that there are uniformed cops in the image the shirtless wonder included in his tweet. Just four minutes later, Rivera sent out another tweet. “Thanks to Officer Kublo and others from the 20th Pct who responded professionally and promptly to Erica’s accident,” Geraldo tweeted. This is not the first wreck that has provided Rivera with an opportunity to promote himself. Last January he slammed into the back of a cab (with his Bentley) while driving to work. He took a selfie at that accident scene as well. There is no credible evidence to suggest that Mr. Rivera is crashing cars in order to keep up his media profile as the result of ratings from the twits on Twitter that tweet about sandwiches, cart accidents and anything else that pops into their tiny little minds.